Carnival Cruise Line has announced inaugural cruises for Carnival Radiance which will join the fleet in 2020 after a huge transformation from Carnival Victory. The cruise line also revealed 2020 itineraries for sister ship Carnival Sunrise which will arrive in 2019. 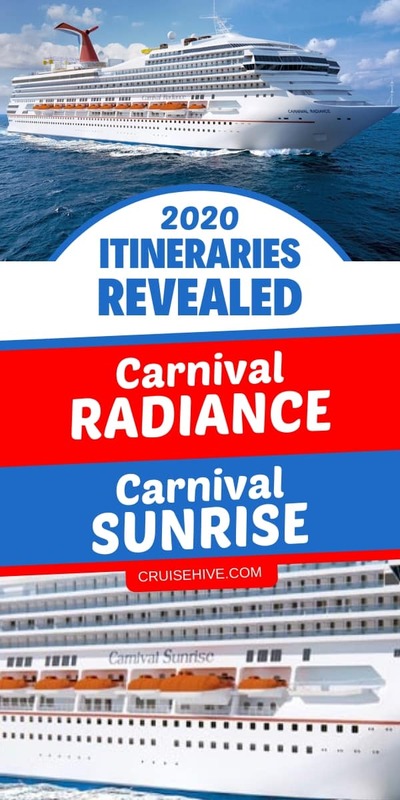 Big news from Carnival Cruise Line today by announcing the inaugural itineraries for the transformed Carnival Radiance in 2020 and the schedule for sister ship Carnival Sunrise. The inaugural season for Carnival Radiance will be a busy one after completing a transformation in Cadiz, Spain. The ship will debut on April 29, 2020, with a 10-day Mediterranean cruise from Barcelona, Spain. The ship will then offer a 9-day and a 10-day sailing including calls in Italy, France, Croatia, Greece, Malta, and Spain. Carnival Radiance will then depart Barcelona for the final time on a transatlantic cruise departing June 11, 2020. The long voyage will last for 13-days ending in New York on June 24. Once in New York, the Carnival cruise ship will sail a series of 4-day and 6-day Bermuda cruises along with 4-day sailings to Saint John, New Brunswick. There will be even more options from the Big Apple with the ship also offering 8-day eastern Caribbean sailings and 9-day sailings which will include an overnight in Havana, Cuba, the first Cuba cruises from New York! Carnival Cruise Line is going full speed with the offering of Carnival Radiance on the U.S. east coast with the ship also sailing from 5-day to 7-day voyages from Norfolk in October and November 2020. The 7-day itineraries will be include calls to Cuba too and stops in the Bahamas. Also from the northeast will be 5-day and 6-day cruises to the Bahamas including calls to Carnival’s private island of Half Moon Cay. After a very busy season sailing from New York Carnival Radiance will reposition to Port Canaveral, Florida. The ship will begin a new winter season offering 6-day to 8-day voyages to the Caribbean and Cuba starting on November 8, 2020. The 6-day cruises will include calls in Havana, Cuba and two ports in the Bahamas. Another alternative 6-day sailing will include calls in Grand Turk, Amber Cove, Dominican Republic, and Nassau, Bahamas. The 7-day and 8-day sailings will include calls Aruba, Curacao, St. Kitts and Grand Turk. Carnival Sunrise is being transformed in 2019 from Carnival Triumph Cruise Hive readers can find out more about the inaugural cruises right here. 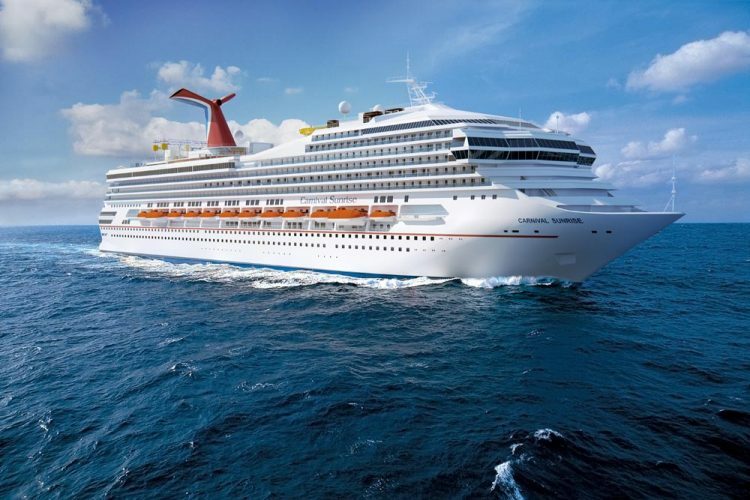 Starting on May 21, 2020, Carnival Sunrise will offer a series of getaways to Bermuda along with longer sailings to the Caribbean and Cuba. The ship will be based from New York. The ship will sail eight 9-day voyages to Havana, Cuba including an overnight stay and calls at Half Moon Cay and Nassau both in the Bahamas. Carnival Sunrise will offer eight 4-day cruises to Bermuda where the ship will spend a full day in port. Seven 8-day sailings will be available with the ship sailing to the Caribbean and the Bahamas. In May 2020 the Carnival cruise ship will also offer two 5-day cruises from Norfolk along with one 6-day voyage. These cruises will feature the popular cruise destinations of Half Moon Cay, Nassau, and Freeport all in the Bahamas. Carnival Radiance and Carnival Sunrise will each undergo major multi-million dollar dry docks and both will bring the very latest features that Carnival Cruise Line has. Just yesterday the Miami-based cruise line revealed a new restaurant venue named “Big Chicken” will be introduced on Carnival Radiance when she debuts in 2020. Keep checking Cruise Hive for all the latest developments as Carnival releases further details about these two fresh new ships coming in 2019 and 2020.